In a move to create a more cohesive global brand image, Doritos recently announced plans to update the logo design, marketing, and packaging for its products across the 37 countries where its chips are sold. 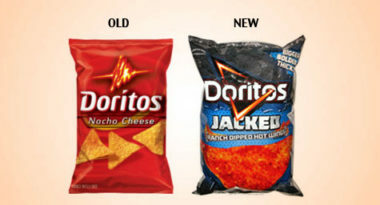 The brand’s first global ad campaign and redesigned Doritos packaging were released in early March. AdAge.com reported on the details behind the Doritos global update. Owned by PepsiCo’s Frito-Lay North America, Doritos is the world’s largest tortilla chip brand with 39 percent market share. Despite Doritos’ massive global presence, the brand surprisingly had 25 packaging variations in different markets before the redesign. This new unified marketing campaign is expected to leverage enormous international scale and worldwide popularity. The integrated ad campaign includes digital marketing and television. TV advertising will start airing on U.S. cable channels in the middle of March and be adapted for international markets such as the UK, Mexico, Canada, and Spain. The digital components of the ad campaign include leveraging social media at the South by Southwest Conference and Festival in Austin, Texas. At the hip festival, Doritos is sponsoring a battle of the bands where three musical acts compete to open for a big-name hip-hop concert. People are being asked to vote for their favorite opening act on Twitter and the concert will be streamed on the Doritos Facebook page. To learn more about the latest advertising and marketing trends, contact MDG Advertising. MDG Advertising, a full-service advertising agency with offices in Boca Raton and New York, NY, is one of Florida’s top integrated marketing agencies. MDG specializes in developing targeted Internet marketing solutions, exceptional creative executions and solid branding and media buying strategies that give clients a competitive advantage. Our core capabilities include print advertising, branding, logo design, creative, digital marketing, media planning and buying, radio and TV advertising, Web design and development, email marketing, social media marketing, and SEO. To stay on top of the latest advertising and marketing trends, contact MDG Advertising.